At the beginning of 2013 the San Diego Zoo (world’s second best zoo, by the way- the first one is the Henry Doorly Zoo in Omaha, Nebraska, in case you wondered) acquired around 20 koalas, which they were soon planning to insert into their own custom made habitat at the new Australian Outback exhibition. Since most of the people visiting the zoo come from southern California, MC Saatchi agency came up with the Koalafornia campaign, where little cute Koalas would “invade” California and do human things like there was nothing weird about it. I worked closely with the creatives, starting from their scripts and adding some fun details here and there, while keeping in mind the limitations of having to work with a puppet and its respective puppeteers. We had a back up plan to go shoot real koalas at the zoo against green screen, in case the puppet didn’t look real enough; but when we saw the first comped footage we gladly realized we didn’t need that. Overall, this was one of the most entertaining projects I’ve been part of. The campaign even won an award from the Association of Zoos and Aquariums for “Campaign Budget more than $175,000”. 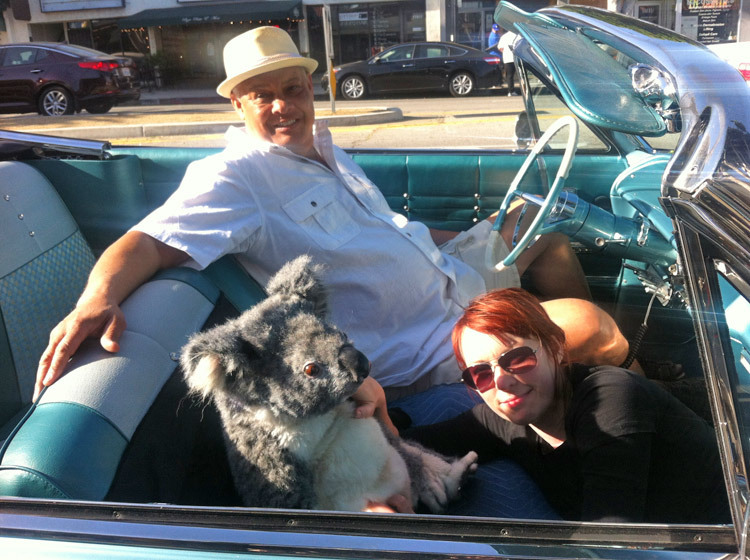 The puppeteer (girl crouching) had to throw the koala in the air every time the car bounced. The owner of the car was counting every bounce and make us pay more every time we did it- aaahh, pressure.